The caves beneath the moors once served as the lair of the evil Alessian general, Faolchu the Changeling. Glenumbra Moors is a battlefield in central Glenumbra, and the location of the ancient Battle of Glenumbra Moors. The Mages Guild is researching the battlefield to try to locate any information on how to defeat the werewolf Faolchu. 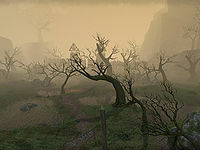 Glenumbra Moors Objective: Discover the secret of Faolchu's weakness. † Only if Alana Relin is saved.